Tired of wearing scarves or taking cover under a turtleneck? Everyone ages differently and your genetic make up and/or weight fluctuations will greatly affect the types of changes you see in the mirror. If your neck seems to be aging faster than your face, then you may want to consider a necklift. This procedure to remove excess skin and restore a sagging neckline can take years off the way you look and feel. The goal of a necklift is not only to lift and tighten loose skin, but also to elevate the underlying muscle and soft tissue back to a more youthful position. 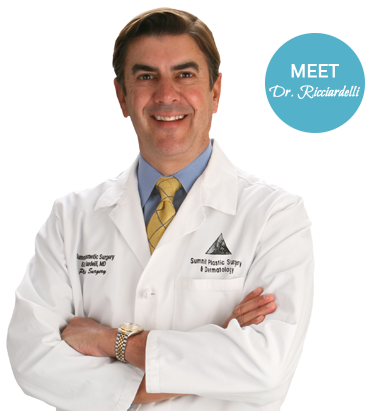 Dr. Ricciardelli has over 25 years of facial surgery experience and keenly aware of what is crucial to help restore a well-defined, elegant, and youthful appearance. “Whether you have minor skin laxity or a combination of loose skin and fullness in the neck, I can help you choose a procedure or combination of procedures to produce outstanding results,” says Dr. Ricciardelli. There is no substitution for experience and understanding when you are considering facial surgery. No two faces age alike and Dr. Ricciardelli’s approach to your surgery will depend on the degree of changes. Is necklift surgery for me? If you are bothered by a sagging neck and banding (protruding muscles) then necklift surgery may be for you. Dr. Ricciardelli appreciates and understands the nuanced relationships between facial structure and skin. He will use a variety of surgical techniques when tightening the skin and underlying muscles to reduce the signs of aging. He might recommend a little liposuction to remove excess fat. Dr. Ricciardelli take meticulous care to ensure that your incisions are well-concealed in the hairline or within natural creases. Your options for neck restoration will be discussed at length during your cosmetic consultation. What can I expect during and after surgery? Your privacy and safety are very important to us. On the day of your surgery you will park in a designated, convenience space in back of the Summit building close to the private back door entrance of our office. Your surgery will most likely be performed in our AAAASF (Association for Accreditation of Ambulatory Surgery Facilities) certified operating suite. Your surgery may take one to two hours depending on the procedure. After surgery, you will wake up in our warm and caring recovery suite. Our recovery nurse will make sure that you are comfortable and inform your designated driver when you are ready to return to the comfort of your own home that day. You will be given detailed instructions for your specific needs. Most patients do not complain of pain after surgery but a mild discomfort. On average, most patients are able to return to work in 7 days and begin light exercising in 2 weeks. A lot will depend on your level of activity at work. You will be seen back in the office after surgery. Expect to have possible bruising, swelling and tenderness after surgery. Dr. Ricciardelli will call you in the evening to check-in on your progress as well as see you back in the office for your post-operative visits. Our door is always open for any questions. Why choose Summit Plastic Surgery & Dermatology? Expect to have possible bruising, swelling and tenderness of the breasts after surgery. Dr. Ricciardelli will call you in the evening to check-in on your progress as well as see you back in the office for your post-operative visits. Our door is always open for any questions you or your caretaker have about your procedure.